To make the cookie dough, stir together the butter and sugar in a mixing bowl until smooth. Mix in the flour, then the vanilla and chocolate chips. Form the dough into a disk, wrap in plastic wrap and refrigerate until firm. To make the ice cream, melt the butter in a medium saucepan over medium-high heat. Continue heating, stirring often, until the butter is a deep golden brown color, being careful not to burn it. Whisk in the heavy cream and heat until simmering. Meanwhile in a medium bowl, whisk together the brown sugar and the egg yolks until pale and fluffy. Once the cream mixture is warm, add a small amount to the bowl with the egg yolks, whisking constantly. Slowly whisk in the rest of the cream. Mix in the salt. Return the egg-cream mixture to the saucepan and heat until just slightly thickened, and the temperature reads 170-175˚ F on an instant-read thermometer. Immediately remove the mixture from the heat and pour through a fine mesh sieve into a bowl. Stir in the vanilla extract and the whole milk. Cover and chill thoroughly in the refrigerator. Once the mixture is chilled, freeze in an ice cream maker according to the manufacturer’s instructions. 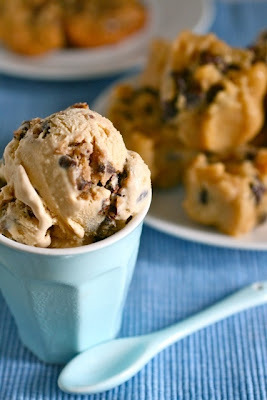 Chop the disk of cookie dough into small chunks. As soon as the mixture is done churning, transfer to a bowl or airtight container and stir in the chocolate chips and the chunks of cookie dough. Store in the freezer until firm.